Proper posture is the most important element in establishing good ergonomic work practices. During repetitive tasks such as pipetting, maintaining body positions that provide a maximum of strength with the least amount of muscular stress is important to minimize the risk of injury. A number of common pipetting techniques have been identified as potentially hazardous due to biomechanical stress factors. Graphic representations and the recommendations for corrective actions, made by various US governmental agencies and ergonomics experts, are presented below. Technique: elevated, “winged elbow”. The average human arm weighs approximately 6% of the total body weight. 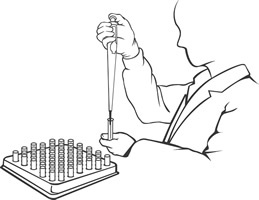 Holding a pipette with the elbow extended (winged elbow) in a static position places the weight of the arm onto the neck and shoulder muscles and reduces blood flow, thereby causing stress and fatigue. Muscle strength is also substantially reduced as arm flexion is increased. Corrective action: Position elbows as close to the body as possible, with arms and wrists extended in straight, neutral positions (handshake posture). Keep work items within easy reach to limit extension and elevation of arm. Arm/hand elevation should not exceed 12” from the worksurface. Technique: Over-rotated forearm and wrist. Rotation of the forearm in a supinated position (palm up) and/or wrist flexion increases the fluid pressure in the carpal tunnel. This increased pressure can result in compression of soft tissues like nerves, tendons and blood vessels, causing numbness in the thumb and fingers. Corrective action: Forearm rotation angle near 45° pronation (palm down) should be maintained to minimize carpal tunnel pressure during repetitive activity. Technique: Tight grip (clenched fist). Hand fatigue results from continuous contact between a hard object and sensitive tissues. This occurs when a firm grip is needed to hold a pipette, such as when jamming on a tip, and results in diminished hand strength. 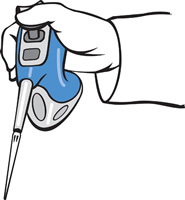 Corrective action: Use pipettes with hooks or other attributes that allow a relaxed grip and/or alleviate need to constantly grip the pipette. This will reduce tension in the arm, wrist and hand. Technique: Concentrated area of force (contact stress between a hard object and sensitive tissues). Some devices have plungers and buttons with limited surface areas, requiring a great deal of force to be expended by the thumb or other finger in a concentrated area. 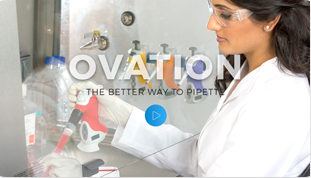 Corrective action: Use pipettes with large contoured or rounded plungers and buttons. This will disperse the pressure used to operate the pipette across the entire surface of the thumb or finger, reducing contact pressure to acceptable levels. Technique: elevated arm. Muscle strength is substantially reduced when arm flexion is increased. Corrective action: Keep work items within easy reach to limit extension and elevation of arm. Arm/hand elevation should also not exceed 12” from the worksurface. Technique: Elbow flexion or abduction. 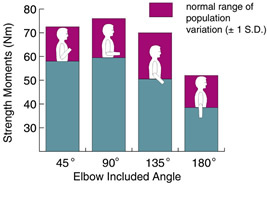 Arm strength diminishes as elbow posture is deviated from a 90° position. Corrective action: Keep forearm and hand elevation within 12” of the worksurface, which will allow the elbow to remain near a 90° position. 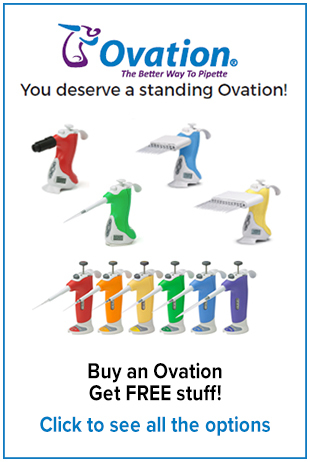 The Ovation BioNatural Pipette was specifically designed to address each of these posture-related concerns.